The two-time All-Star forward signed a veteran's minimum salary to reunite with his old coach. 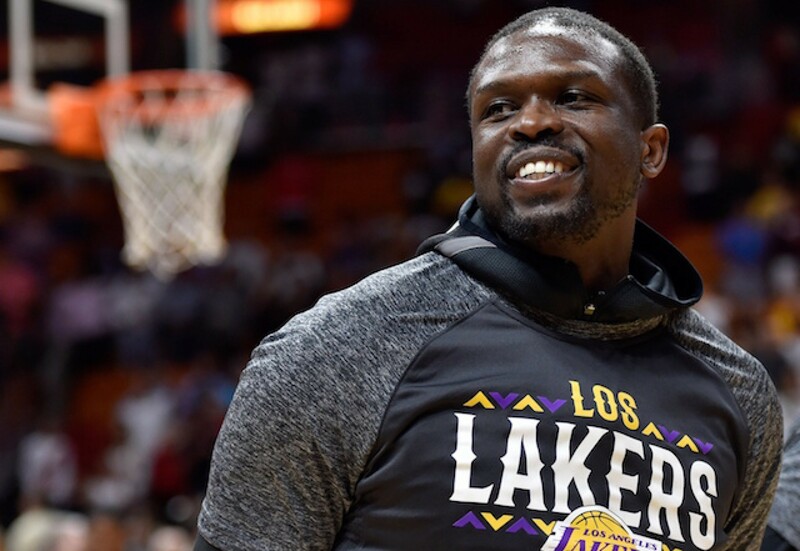 Veteran forward Luol Deng has found a new home in the northwest, as the journeyman wing signed a one-year deal with the Minnesota Timberwolves, according to ESPN's Adrian Wojnarowski. Deng will make $2.4 million to rejoin former Chicago Bulls head coach Tom Thibodeau and former teammates Taj Gibson, Jimmy Butler, and Derrick Rose in Minneapolis. Deng last played for the Los Angeles Lakers, who bought him out of his contract last week. Wojnarowski notes that Deng and Thibodeau--who also serves as president of basketball operations--met earlier today to iron out the specifics of the deal. While Thibodeau didn't guarantee Deng a specific role or amount of playing time, he will get a chance to earn some minutes at a wing position that already features Butler and former first overall pick Andrew Wiggins. Deng is best known for his time with the Bulls, where he spent the first 10 years of his career. When Thibodeau arrived in 2010, the two-way wing became one of his more reliable players, averaging 16.1 points per game with a 52.6 true shooting percentage while compiling 32.7 defensive win shares. Deng was one of Thibodeau's more reliable players, often giving him a heavy workload during the regular season and the playoffs (he led the league in minutes per game in his final two full seasons in Chicago), especially when Rose succumbed to multiple severe knee injuries. Unfortunately, the extended playing time Thibodeau gave Deng affected his already shaky health, as he only played in 80 or more games once during the Thibodeau era. The team traded him to the Cleveland Cavaliers midway through the 2013-14 season and has been a journeyman ever since. He turned in a couple of solid seasons with the Miami Heat before signing a four-year, $72 million deal with the Lakers, a deal that many found baffling. His production in Los Angeles didn't come close to measuring up to that monster deal. He averaged a paltry 7.6 points per game in his first season with the Lakers and sat out for all but 13 minutes last year. With L.A. eyeing next summer's free agency market, they decided to move on from Deng and free up some cap space. Is Thibodeau going to call up Joakim Noah next? How about Carlos Boozer? All kidding aside, Deng will go to Minnesota with absolutely no expectations based on his last two seasons. In theory, he will probably get minutes since the Timberwolves don't have a lot of depth behind Butler and Wiggins, but Thibodeau is infamous for giving his starters a ton of minutes, even if it ultimately costs his team in the long run. That said, Thibodeau got quality minutes out of Rose toward the end of the regular season and during the playoffs, so maybe Deng has a little bit left in him too.